"Developments are now moving incredibly fast. Unfortunately, it's not so much the incumbent automakers that are calling the tune, but primarily the big tech companies and innovative startups." The transition to autonomous mobility will not take place overnight – but it will come much sooner than expected, even as the media hype dies down. 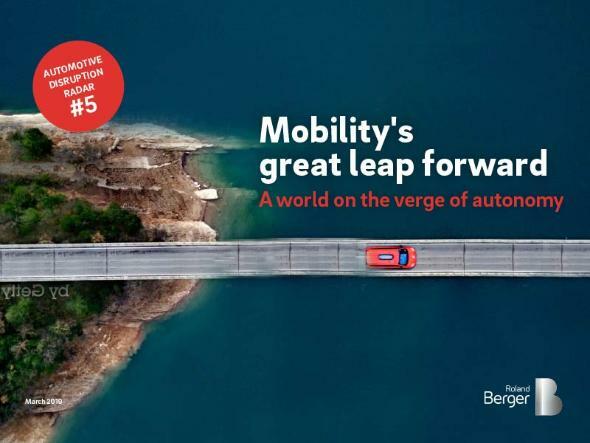 This is one of the key findings of the latest Automotive Disruption Radar, Roland Berger's biannual analysis of the state of developments around autonomous mobility worldwide. As this fifth edition of the study shows, there has been substantial progress on almost all fronts – in the legal framework, in infrastructure, in investment and in consumer acceptance. Following in the footsteps of the United States, other countries are opening up to autonomous vehicle testing and permitting vehicles to be operated without a driver onboard (e.g. the Netherlands, France). The most far-reaching regulation of liability issues to date has been achieved in the UK with the country's Automated and Electric Vehicles Act, which came into force last summer. Good progress is also being made in the expansion of 5G networks – a key prerequisite for autonomous driving. The first commercial networks recently went live in the United States and South Korea, while other countries such as China, Singapore and Dubai have completed 5G frequency allocation. Within sight: The first commercial services in the field of autonomous mobility could soon be on the market. Meanwhile, demand for electric vehicles remains consistently high. China alone, the world's largest market, has seen a near-fourfold increase in the share of electric vehicles among total vehicle sales in the past two years. More and more cities are banning gasoline and diesel vehicles from driving on urban roads, and this is likely to be having a significant impact. The share of cities that have such bans or restrictions in place has risen from 24 to 44 percent since 2017. Investors, too, now recognize autonomous mobility as an attractive future market. Japan's Softbank is pouring as much as one billion US dollars in several tranches into American startup Nuro, which uses autonomous vehicles to transport people's shopping over the "last mile" to their homes or offices. Two further startups have received funding commitments of up to half a billion dollars. Ever increasing sums of capital are flowing into artificial intelligence projects – likely on the assumption that it is partly "smart" algorithms that could ultimately help fully autonomous driving achieve their big market breakthrough. 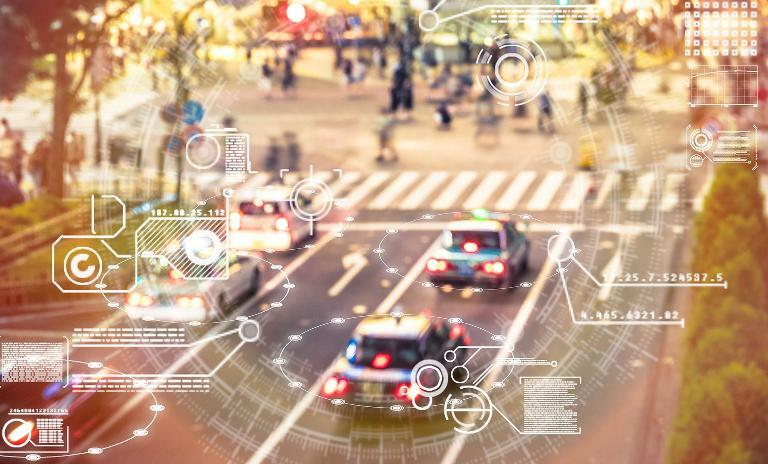 This leads on to a second key finding of the latest Automotive Disruption Radar: Most of the promising projects are being conducted by tech giants such as Google's Waymo or by agile, innovative startups. The major car manufacturers, already facing huge challenges in relation to battery technology and similar issues, play a secondary role at best. Shrinking margins could make their lives even harder in the future. Good new ideas are what's needed, for example in the area of purpose-built vehicles. This innovative class of vehicles featuring a flexible interior is tailored to the needs of the user and is economical to maintain, as well as being practical, environmentally friendly and comfortable. Indeed, many believe that this is the vehicle of the future. So it is high time for OEMs and suppliers to adapt their business models to the changes in the nature of demand. 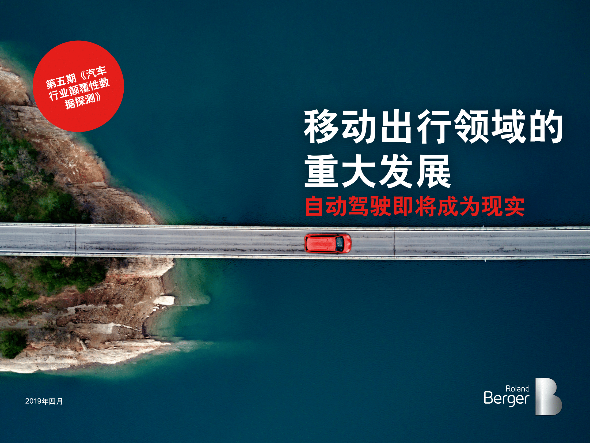 The first cross-manufacturer cooperative projects on mobility services and the development of self-driving systems have already been announced. Others will follow. 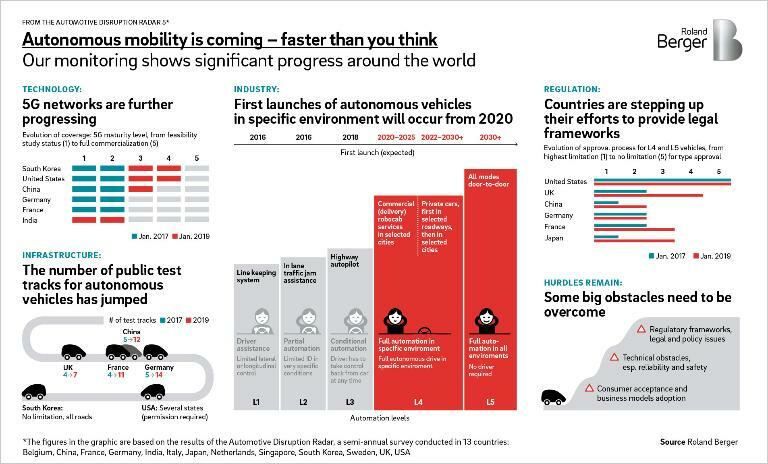 Three years ago, when we published a report predicting that fully autonomous robocabs could cover more than a quarter of the global mobility market by 2030, it sounded like a pretty bold statement. Despite all of the technical hurdles, it now looks as if it will take no more than five years for the first commercial providers to achieve significant sales in this field. The new Automotive Disruption Radar: Thanks to major progress in regulatory frameworks, infrastructure, investment and consumer acceptance, the first autonomous vehicles will be with us sooner than expected.